I have done this thousands of time, tried to give people a quick explaination of what this instrument I’m playing is. So, while I was doing these videos at Lou’s Ponderosa, I decided I might as well record that as well. I really want to put together a good video presentation of the dulcimer, but till I do, I could at least capture the standard stage rap on it for people on the web. Maybe this is better really, since it is a quick patter honed by years of use. Though I still plan to make a specific video where I can use more camera shots, and take more time, to show the dulcimer to people. 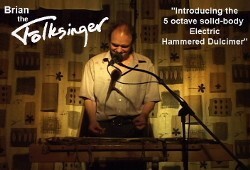 This entry was posted on Friday, May 1st, 2009 at 8:25 pm	and is filed under The Electric Hammered Dulcimer. You can follow any responses to this entry through the RSS 2.0 feed. Both comments and pings are currently closed.